Sometimes it really does seem as if the baseball gods are just messing with us. For 162 games they continuously let us believe one storyline, and an instant later they rewrite the entire script. 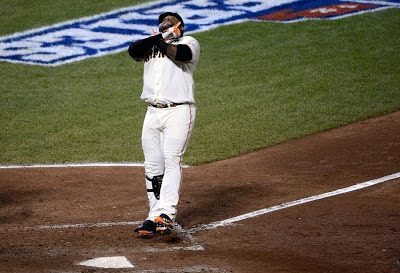 Last night Pablo Sandoval became the fourth player to hit three home runs in a World Series game, joining Babe Ruth (did it twice), Reggie Jackson, and Albert Pujols. This one just seems a little more shocking to me. It isn't that Sandoval isn't a solid power hitter, but his name doesn't yet seem to carry the same gravitas as the rest of the list. It's just tough to see something like this coming from a guy who has yet to top 25 HR in a season. Pujols had already had four 3-HR games when he had his game and Reggie Jackson had done it once. This of course was Sandoval's first such game. Going into their World Series games, Jackson averaged a home run once every 19.9 PA, Pujols was at 16.7, and Ruth was at a spectacular 15.7 (first time he did it). Sandoval is way up at 30.4. Of course though, anyone can have a good night. It just didn't seem likely to happen to a Giant this season, especially while playing at home. The Giants finished dead last in the league this year with only 103 homers. Of those 103, only 31 came at home. Miguel Cabrera alone hit 28 at home! Sandoval himself was only one of three Giants to even hit three homers at home this season, being responsible for seven. He hit almost half his home season total last night. They weren't cheap shots either, two to dead center, and one going the opposite way. It was only even the second time that anyone hit three homers in a game at AT&T park. Ever. To make it more fascinating, two of the homers came off reigning MVP and Cy Young winner Justin Verlander. Maybe worrying about having to bat got to him. What does any of this mean for the rest of the series? Probably nothing. Just know that the baseball gods like to keep things interesting.